Although my stale yet go-to joke these days is that I have no idea where I am because everything looks different, change is welcome in several different areas. One of those areas is, of course, having an incredible array of dining and brunching options ranging from solid to amazing. Recently, I had the chance to preview brunch at Mission Navy Yard, and it did not disappoint. Mission Navy Yard, 1221 Van Street SE, has been open for a couple of months and they just recently launched their brunch menu. The airy, light-filled, balcony-wrapped eatery with a view to Nationals Park (nice) and South Capitol Street (meh) –which also boasts the largest bar in the District– has an array of dressed-up brunch and Mexican food favorites for brunch. The amalgam works beautifully. From nachos with an artfully perched poached egg to loose chorizo atop rice, to the fanciest breakfast tacos enhanced with chimichurri sauce, chef Roberto Hernandez elevates the experience of Mexican food and brunch at the same time, while still keeping the food accessible and, frankly, delicious. Mission’s cocktails looked excellent. I tried their version of a Paloma, called Once Upon a Time in Mexico, and it was poetic and perfect and just the kind of classy drink you want to eat with all this classy food. If you’re the kind of person who brunches hard, Mission may be a revelation to you: at $33.99 per person, the Bottomless Brunch is a great solution for groups of friends who want to linger, chat and have snacks coming for several hours. If you cannot wait until the weekend to make it to Mission, then by all means celebrate National Taco Day TODAY! 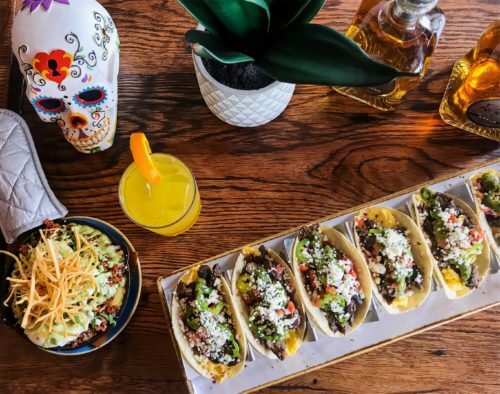 Mission has a Taco Day special, starting at 5 p.m. You can get their chorizo, chicken or veggie tacos for $3.50 a pop, and pair them with $7 Mission Margaritas ($22 for the carafe) through closing.